Filmed by Bike, Portland, Oregon’s famed bicycle-themed film festival is making a stop at the Egyptian Theatre Friday, January 18, 2019. The traveling festival features more than 15 films from all over the world. The Boise showing will be divided into two parts; Bike Love and Adventure Shorts. Presented by the Idaho Walk Bike Alliance, the festival raises funds for walk and bike advocacy across the state. The title sponsor of this year’s Filmed by Bike is Spokey Joe’s Bikes and Gear, a brand-new bike shop in Boise. Tickets will be available through the Egyptian Theatre website ! There will be a raffle! See you there! 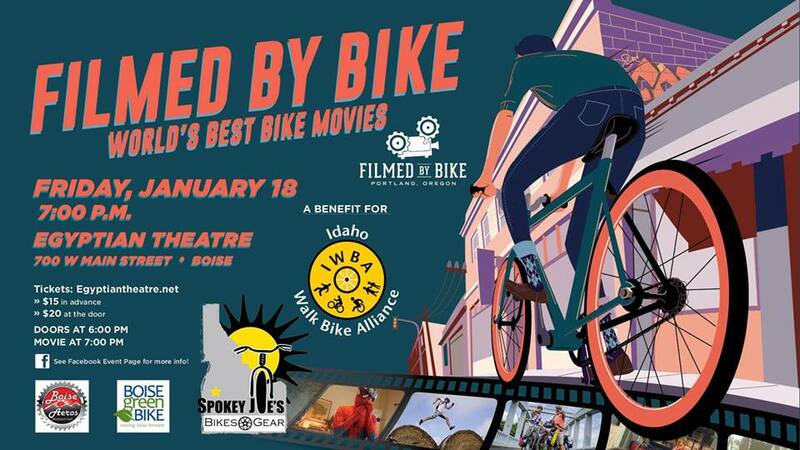 Filmed by Bike-World's Best Bike Movies returns to the Egyptian Theatre in Boise. Friday January 18th. Tickets on sale now at Egyptiantheatre.net Thanks to Lars C. Larsen of nanofarm.tv for our trailers this year.